The cover of the 2017 Ikea catalogue. Legend has it that after the Bible, the second-most popular book found in homes around the world is the Ikea catalogue. This year, between Aug. 14 and Aug. 25, Ikea will distribute almost 7 million copies of its latest volume in Canada alone. The Sweden-based furniture retailer's catalogue has been around since 1951, when the company was operating as a mail-order business. But do people still flip through it? After all, the average consumer's attention span is eight seconds, according to a 2015 white paper from Canada Post. At a time when the smart phone is king and there's a mobile app for almost anything you could imagine (yes, even the Ikea catalogue), a print catalogue seems like a novelty, and yet, it continues to be a valuable marketing tool – so much so that companies that once gave up on the format are bringing it back. "If you do a catalogue well it works – even in today's market, even to the millennials," says Derek Lackey, president of the Direct Marketing Association of Canada. He says that companies that saw email and social media as free direct marketing tools overused them to their detriment. "We thought it was going to be a panacea, but it's not. There are still things that catalogues do really well. So what we're experiencing now is a settling down of the shiny penny and getting back to the reality of producing good results with our marketing tools." Indeed, in that same Canada Post study it was found that 40 per cent of those who receive catalogues keep them for at least a month, with 20 per cent of those surveyed indicating they keep catalogues for at least four months. This longevity is a reason why, beyond offering an inventory listing, catalogues are increasingly taking cues from lifestyle magazines and incorporating editorial content to inspire consumers. The relaunched Canadian Tire catalogue displayed on a tablet. 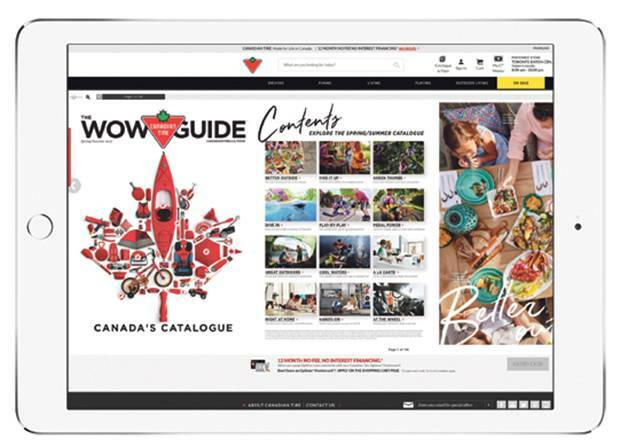 After a nine year hiatus, Canadian Tire relaunched its catalogue under the moniker "Wow Guide" in 2015 in an effort to show shoppers that the company's product offering had evolved. "If you compare our catalogue from 2006 and 2016 it's significantly different," says Jason Blanchette, vice president of planning and promotions for the retailer. "The 2006 catalogue was more about doing what digital does today – putting every single product in print to show everything we do. Now it's more storytelling, showing more lifestyle shots and showcasing them in the best way to inspire Canadians." The catalogue was launched with an interactive component, using image recognition software via the company's app, that leads shoppers from the print publication to the store's website. "This wasn't about putting out a print catalogue," Blanchette says. "It was meant to be a gateway to go on to the site. Print is still where the customers are and what they consume, and we want to be with the customers." Lackey expects retailers to continue integrating technology with their catalogues. "You're going to see some catalogues coming up that use virtual reality, where by scanning something, you can actually put yourself in that room and look around in a full 3-D way." "My daughter, who's 36, lives in California, and I see when Restoration Hardware's bundle of catalogues arrive at her door," says Lackey. "They usually send seven or eight catalogues at once and they're gorgeous – they're as good as any consumer magazine. My daughter immediately gobbles them up. First she's annoyed because they used all that paper. And then she's into them." 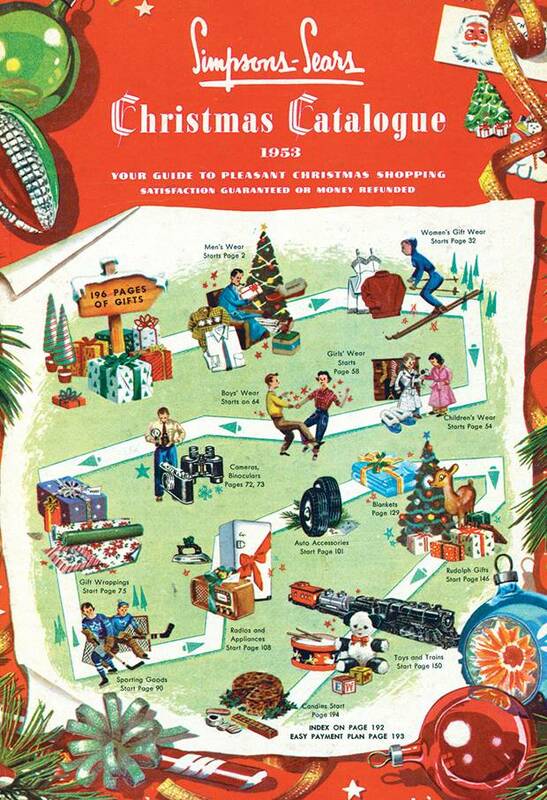 The first Sears Christmas catalogue, from 1953. At Ikea, the catalogue moment is key, and the book has developed a vocal fan base as a result of shoppers flipping through its pages. "You can see after the launch every year it gets quite a lot of reaction on social media," says Tanja Dolphin, Ikea's global catalogue leader. "Not everything's positive of course. Last year in Germany we got a lot of feedback that the catalogue was perceived as a little bit dark and gloomy in the colours. They were missing a more bright and positive Ikea feel to the images. So this year we've taken that into consideration. [Images are] much more brighter and positive and there is a more detailed colour scheme that is more in line with the Ikea brand personality." The 2017 edition of the catalogue was the company's first foray into an editorialized approach, and it was well received. "Loyal Ikea customers actually demand more storytelling around the brand and the products," Dolphin says, adding that, for the 2018 edition, the company is creating "the next generation" of its catalogue editorial. The evolution of the retailer's catalogue app continues, but the print product still reigns supreme. "Over the long run its significance might change, but at the moment it still represents the majority of our marketing spend," says Dolphin. "It's deeply rooted in our DNA."